There are many reasons to consider buying an electric fireplace for sale at one of our electric fireplace showrooms. Popular (nation-wide) due to their simplicity, electric fireplaces are easy and inexpensive to install, and do not require the need for professional installation or access to a chimney / venting. Thanks to the high-level of efficiency you experience from electric fireplaces, they dissipate heat directly into the room, without heat being lost through the chimney. Convenient remote-control operation and thermostat settings on many models allow users to dial-in their comfort level, accessing as much or as little heat as they want at the touch of a button. 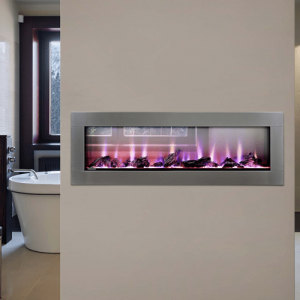 Digital “flames” offer ambiance, with the capacity to turn off heat, yet still enjoy that cozy fire feel year-round. Check out our electric fireplaces for sale by visiting one of our electric fireplace showrooms, or by viewing our offerings online! Our electric fireplace showrooms carry a wide variety of fully-functional displays so that you may experience them fully before you commit to buying one. 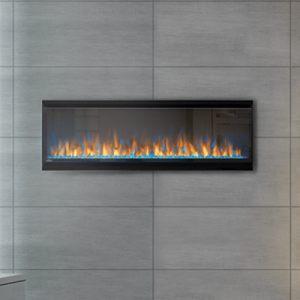 Is an electric fireplace for you? mantel, or recess into any wall, plug-in and enjoy. solution for those who have yet to purchase a home of their own, but want a fireplace in their rented home. Keep flammable objects sufficient distance away from your fireplace heating element. Don’t overload the outlet (or circuit) that powers it. Keep the cord free of electrical hazards, such as water or tripping. Never leave your electric fireplace operating when no one is home. 1,500W heater, which can heat up to 400-500 square feet. heaters. Digitalized flames are more realistic than ever before, offering enjoyment regardless of the season. fireplace installation may not be feasible. fireplaces carry no carbon monoxide risks as compared to combustion models. with an electric fireplace today!